What Kind of Coffee for French Presses Is Best? There is something so chic with using a French press. To a lot of people, going through the French press method is still the best way to go to have great tasting coffee, but sometimes, it is not only about the brewing method, but it is also about the coffee. So, what kind of coffee for French presses is best? This might be a surprise to some people, but the brewing method should also pair well with the type of coffee grounds that you have. It does not only have something to do with technique, but it is also science. Different brewing methods employ a variety of brewing mechanisms, and surely, these mechanisms will respond well to particular kinds of coffee. 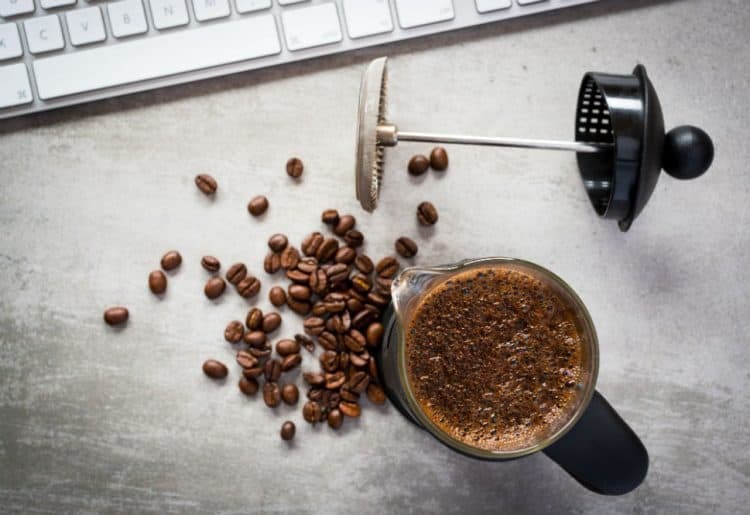 You might be already panicking, especially if you are not a coffee connoisseur, but you can relax now as we will help you brave your way through the various types of coffee grounds. We are going to discuss the basic kinds of coffee and what works best with a French press. We are also going to give you some tips and tricks on how to make the most out of your French press even if you do not have the ideal kind of coffee. Lastly, in order to really have a deeper understanding of the French press, we will discuss why it needs a certain type of coffee bean. Not quite getting the best coffee with your French press? Then, find out what you have been doing wrong. Why Does a French Press Need a Specific Kind of Coffee? Before you call a French press a diva, keep in mind that this coffee brewing method has been in existence for a long time. It is one of the classic ways of brewing coffee, so it is a given that its mechanism is pretty simple. The main attraction of a French press is its plunger, and with it comes the attached filtration system. The plunger pushes down on the coffee beans while the filtration system makes sure that no stray grounds will travel on to the finished product. Simple, right? However, this simplicity has its share of pros and cons. Let us start with the pros. Preparation is easy, and it depends on the grind whether you have a mild or strong coffee. Aroma is also appropriately released in this process. On the other hand, a huge con is the fact that you do not have a hand on proper extraction. Yes, you can mix the grounds once the water is there, but other than that, you cannot do anything. You just have to let it be and pray to the heavens above that the coffee grounds will have flavor. This is why there should be a certain kind of coffee to be used for a French press. It has a lot to do with flavor, color, and aroma. With such a simple mechanism, you have to make sure that you have set yourself up for success by using a coffee which flavor can be extracted by merely steeping it. Before we move on to what kind of coffee for French presses are ideal, let us discuss a vital part of using a French press, and that is the perfect coffee grind. Rule of thumb is to use a coarse grind. It is the best grind for a French press because it can produce a strong flavor, but at the same time, the filtration system will not have a hard time with stray grounds. Logic dictates that if you have a slightly bigger coffee ground, it will not pass through a steel or mesh filter. On the other hand, some types of coffee need to be finely ground in order to properly release its flavor. Do not worry as you do not have to familiarize yourself with coffee varieties. The right grind is usually specified in the packaging of the coffee beans. Let us now go over some of the best types of coffee for a French press. This type of coffee bean is best for a French press because as is, it has a rich taste. Grinding it up into a coarse grind will make the flavor milder. Now imagine that steeping with water, the result is a rich but mild coffee flavor. Some varieties of this coffee do not even need to be ground. In fact, they just have to be smashed or crushed with a knife, and this feature will not give your filters a hard time. This is somehow a hard coffee bean to master because there are specific grinds to follow. Nonetheless, just like what we said earlier, there are usually instructions on the labels. Moving forward, this coffee is best for French press because it has a lot of flavor notes to it. It would make for a complex coffee taste even if you did not press it correctly. Also, this type of coffee tastes excellent by default even if you go for a medium or dark roast, making it best for steeping methods. Yes, it might be surprising to find a strong coffee bean on this list, but that factor alone makes it great for the French press. Of course, we are talking about people who like their coffee strong. With this coffee bean, you need not steep your coffee in the French press for four whole minutes. Two minutes is enough to have an extra dark coffee. It is also best for the French press because this bean is just bursting with robust flavor, that even if you put the wrong amount of water, you will still end up with a strong cup of coffee. In a nutshell, the types of coffee that are best to use when using a French press are those that are of high quality, can be ground coarsely, and has a strong flavor profile. This is the case because the brewing only employs the adding of hot water and steeping it. As simple as it is, it is also the easiest way to brew your coffee wrong. Thus, you have to compensate with a flavorful coffee bean to make sure that you get the right flavor. What’s the Best Espresso Machine for Under $200? Which Single Serve Coffee Machine Makes The Hottest Coffee? Keurig K50 Vs K55: What’s the Difference Between the Two? Some recommended products may use affiliate links. PickAndBrew.com is a participant in the Amazon Services LLC Associates Program, an affiliate advertising program designed to provide a means for sites to earn advertising fees by advertising and linking to Amazon.com. Amazon and the Amazon logo are trademarks of Amazon.com, Inc or its affiliates.